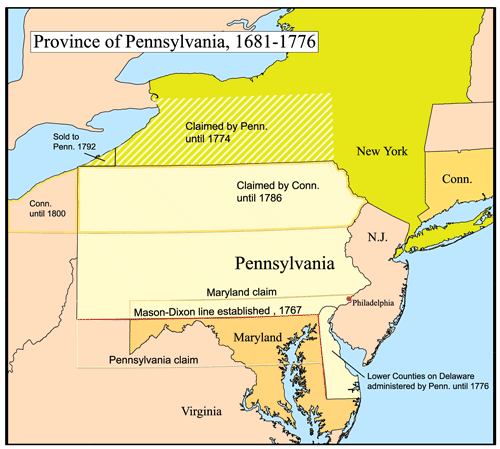 Pennsylvania's origins can be traced back to an unpaid loan. Basically, the King of England owed the Penn family a considerable sum of cash. However Admiral Penn's son, who inherited the debt, was willing to take land in the New World in lieu of the cash. William Penn had converted to Quakerism and wanted to find a safe refuge for them. Quakers had already attempted to set up a colony in New Jersey but had run into jurisdictional difficulties with the colony of New York. The high moral and religious principles of the Quakers meant that they did pose various challenges to the Crown of England: For example, their pacific tendencies would be no good for a king who's dominions needed defending and if they were not prepared to fight, why should anyone else have. So the king actually felt that he was getting a particularly good deal. Not only was he paying off his debt but he was also getting rid of a troublesome minority from the heart of his kingdom. 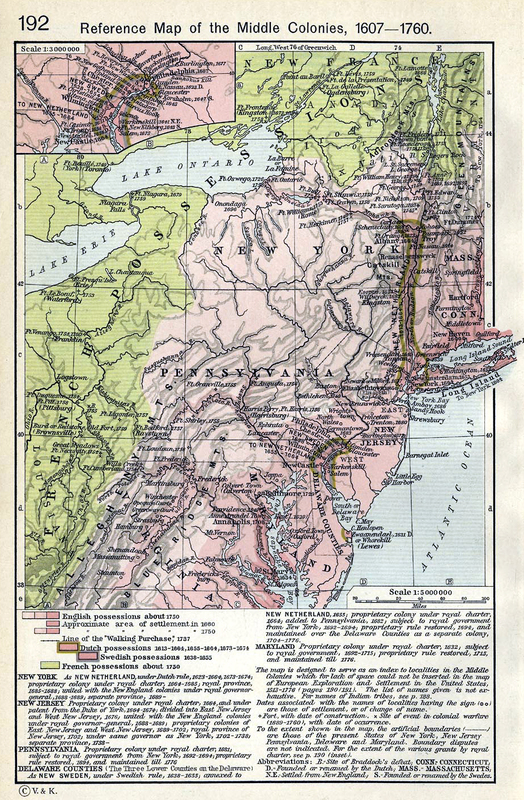 Penn asked for the territory west of the Delaware River and from the northern boundary of Maryland to the north "as far as plantable, which is altogether Indian." It was the largest grant ever made to a single man in America. Unbeknownst to most, the land was unusually fertile and rich and would make prime land for the devout and diligent Quakers. Partly out of principle but also out of self-interest, William Penn granted an unusually liberal government in the hope of attracting colonists to these rich and fertile lands. He offered five thousand acres for one hundred pounds and one hundred acres for two pounds. Penn appointed his relative, William Markham, the first governor of Pennsylvania, and in the autumn of 1681 sent him ahead with three shiploads of emigrants. William followed the following year. The growth of Philadelphia was phenomenal. In less than four years it had passed New York, which had been founded sixty years before. 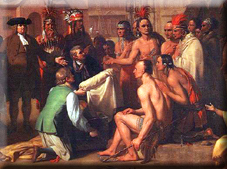 William with his Quaker pacifism and sincerity made a positive impression on the Indian chiefs in the area who were happy to live side by side with these men of peace. In the early spring of 1683 the legislature of the colony met in Philadelphia. The proprietor presented a new frame of government, giving all power of lawmaking into the hands of the people represented by a council which should originate all laws and an assembly that should approve them. All freemen were made citizens and all Christians were freemen, except servants and convicts. It has to be said that for all William's hard work, he had a rather unfortunate end. Swindled by his steward back in England, he returned to his mother country in 1701 only to be thrown into debtors prison. He later became paralysed and died in 1718 unable to return to his beloved colony.